Stainless steel aquatic chairs are ideal for use in swimming pools with ramps, collapsible for easy storage. 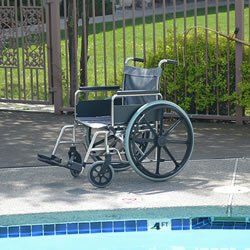 Stainless Steel Wheelchairs are ideal for use in swimming pools with ramps. Constructed of durable and corrosion resistant stainless steel, these chairs will provide you with years of trouble free use. Available in seat widths of: 18″, 20″ and 22″. Weight capacity ranges from 350 lbs. to 500 lbs. depending on the chair width.